Neeson is Nels Coxman, a snowplow operator in the small Colorado resort town of Kehoe. He lives in a cozy cabin with his wife Grace (Laura Dern, TV’s “Big Little Lies”); their son Kyle (Micheal Richardson, “Vox Lux”) is a baggage handler at the local airport. Nels is low-key, but well-respected in the town – he’s even named their Citizen of the Year. But Nels soon sees his life begin to crumble around him. Kyle winds up getting mixed up in the affairs of drug runners moving product through the airport; when he’s in the wrong place at the wrong time, he pays for it with his life. Despite the willingness of the authorities to dismiss Kyle’s death as an unfortunate OD, Nels believes something doesn’t add up. With a little help from his reformed criminal brother Brock (William Forsythe, TV’s “The Man in the High Castle”), he starts brutalizing a path to the top of the heap, where sits slick-haired maniac Viking (Tom Bateman, “Murder on the Orient Express”), a jittery lunatic with an unsettling attitude with regards to parenting his son Ryan (Nicholas Holmes, TV’s “Project Blue Book”). What follows is an escalation as Nels starts to work his way up the ladder, eliminating various thugs along the way as he tries to get to the man in charge. It gets even more complicated when Native American drug lord White Bull (Tom Jackson, TV’s “Cardinal”) becomes involved, as does a gung-ho new Kehoe cop named Kim Dash (Emmy Rossum, TV’s “Shameless”). The body count mounts (amusingly recounted with an ongoing series of title cards) as Nels clumsily makes every effort to make Viking and his men pay for what they did to Kyle. 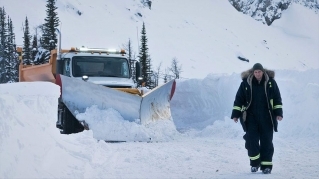 “Cold Pursuit” marks the American film debut of Norwegian director Hans Petter Moland (he directed the original film as well as this one, adapted by Frank Baldwin from Kim Fupz Aakeson’s script). It’s another effort to Americanize a piece of Scandinavian noir, albeit one with more of a sense of humor – a bleak, black sense of humor, to be sure, but humor nevertheless. And it’s a relatively successful one, thanks to the juxtaposition of grimness and absurdity; a LOT of people die in this movie, and they die in ways that probably shouldn’t be funny but kind of are anyway. There are multiple moments in “Cold Pursuit” that elicit surprise laughter. The Norwegian sensibility is still very much present, allowing for more than a few pitch-dark chuckles. It gets a bit too on the nose at times, but even those scenes are funny. And when it goes over the top while still maintaining the muted Scandinavia tone? Absurd and kind of hilarious. Neeson brings his full Neeson powers to bear here, once again creating a quiet, somber man who nevertheless contains a nigh-infinite capacity for violent vengeance. It’s 100 percent in the Neeson wheelhouse; he’s clearly comfortable and it shows. There’s an almost laconic ease to his portrayal that juxtaposes nicely with the instances of absurd brutality. It’s nonsense and Neeson knows that it’s nonsense … but he doesn’t treat it like nonsense. The rest of the cast also seems to be well aware of what kind of movie they’re in. The highlight is Bateman, whose portrayal of Viking is almost gleefully idiosyncratic and weird; it’s almost campy at times, yet the heightened energy works in the low-key strangeness of the framework. Forsythe is smooth and sleazy as Brock. Lane and Rossum – two incredibly talented actresses – are good despite having thankless roles and Holmes is good as far as kid actors go. Meanwhile, the assorted mid-level thugs and whatnot commit fully to the bit, which makes everything else even more fun. “Cold Pursuit” is one more example of the B-movie pulpiness in which Liam Neeson revels these days. It’s weird and funny, dark without being dour. There are a lot of ways that this kind of movie can go wrong, but “Cold Pursuit” largely avoids them thanks to a cast that appears delighted to lean into the absurdity and fully engage. Revenge, after all, is a dish best served … cold.